Once again Henley Rowing Club fielded strong representation in events at Walton & Webridge Regatta and Weybridge Ladies Regatta. At Walton and Weybridge, the club had boats in Masters, Senior Men and Women across a range of boat sizes from eight man to four man. The event was held over an 850m downstream course on 21st May, with crews racing two abreast on a straight course – making racing a joy to see for all those spectating from the banks. Contrary to the forecast the weather stayed fine enabling some great and closely fought racing. First out were the men’s quad whom hit stiff competition from Guildford and then Molesey. 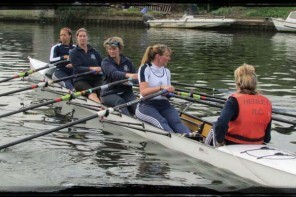 Then came the turn of the Masters mixed eight – a first outing for this crew of both men and women, whom had joined the club as part of the club’s very successful “learn to row” courses. The Henley crew consisted of Mike Hornsby, Sally Robson, Sarah Davies, Phil Davies, Fiona Yates, Christine Lewis, Jiri Rasek, and Barry Redman, coxed by Susanna Venn. The Walton crew had a fast start and quickly established a lead, which by the half way mark had stretched to one length. When Henley put in their final push to the line with 150m to the go, they rapidly closed the gap but ultimately it was the Walton crew who took the victory by the narrow margin of 1 foot. Despite their narrow loss the crew fielded a time of 2.42mins, putting them amongst the fastest crews in the regatta. Henley’s best result of the day however was with the women’s coxed four consisting of Fionnuala Barnes, Nathalie Atkinson, Olivia Ford, Hannah Smith and coxed by Katie Parker (coach: Mike Jennings). The crew comfortably beat Gravesend and then Kingston by over 2.5 lengths. The final was a closer affair but Henley continued their winning streak with a 1-3/4 length win over Eton Excelsior and a time of 3.02mins for the full race. The Weybridge Ladies event took place the following day on Sunday 22nd May. The sunny weather conditions at Walton made for good racing, with a steady light cross wind not playing a major part. This was a 900m upstream race attracting some strong crews & scullers from the region. Members of the winning women’s coxed four from the previous day, were also back on the water – this time in doubles. 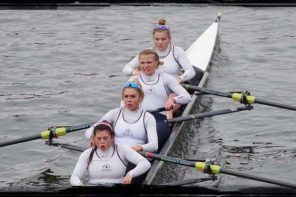 Fionnuala Barnes and Hannah Smith ended up beating their team mates of Nathalie Atkinson & Olivia Ford in the final – securing yet another victory for Henley. The women’s masters squad were also competing with victory to Niki Orr who performed brilliantly in her single with some controlled racing and won Novice singles comfortably. The masters D quad raced well against strong opposition. The girls J14 and J13 quads were also big winners of the day, convincingly beating off competition from Walton, Weybridge and Guildford. 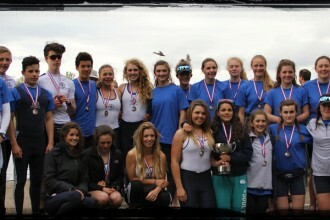 Henley’s junior squads once again proving their strength and depth across multiple races. Pingback: a "difference in the difference between the differences" would indicate which of the following?